Offers free Wi-Fi, power, use of the copy machine as well as lockers and a community lounge. You can use the shared desks as needed, or rent a desk on a monthly basis (fees apply). Four unique meeting rooms are available. You can use the kitchen space for events, seminars and more (Reservations required; fees apply). The free lounge is for everyone to use, free of charge. Use this space for meetings and work, or rent out the space as a location to hold your events and seminars (fees apply). Office spaces are available on a monthly basis to companies, organizations and for projects. The entire office space facility supports your business needs with 24-hour access*, mailboxes and conference rooms, the use of a copy machine and more. *Excludes year-end and New Year holidays, as well as annual power shutdown days. Mobile stalls can be used to exhibit various works and for selling small items, among other uses. The mobile booth can also be used as a reception counter during events. The wall display space in the free lounge can be rented out for use. 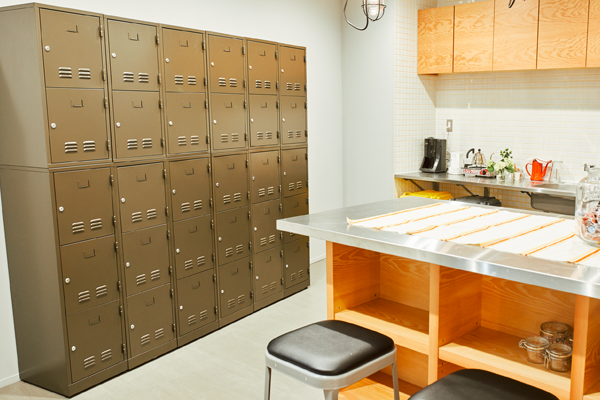 Office and booth users are free to use the lockers on a monthly basis. Copyright © 2018 WORK LAB YATSUGATAKE. All Right Reserved.